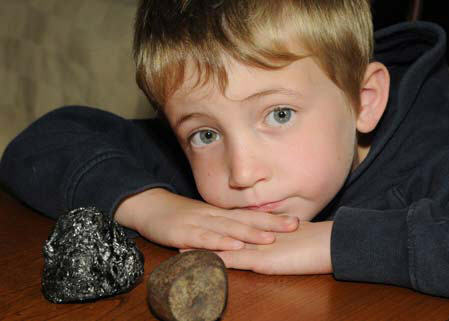 A SIX-year-old stargazer from Bratton Fleming who found what he thought was a meteorite in his back garden has been given a generous gift from one of the worlds most prolific meteorite collectors. Josh Chapple discovered a black, shiny, rock in his garden on Thursday, August 13. The story about his find which featured in the North Devon Journal was read online by Scottish meteorite collector Robert Elliott, who recently sold part of his vast collection at auction for £118,000. Robert got in contact with the Journal to let us know that the item Josh had found was certainly not a meteorite. But, inspired by six-year-old Josh's enthusiasm for astronomy, Robert has given Josh a genuine meteorite which was unearthed in the Sahara desert in 1999 — and which could have been there for more than 10,000 years. Robert said: "I read the story on the Journal website and knew straight away that it wasn't a meteorite. "However, I didn't want Josh to be disappointed so I thought I'd send him a genuine meteorite from my collection. "I think it's great that he was out looking for meteorites at such a young age — it shows a great spark of enthusiasm." Josh was delighted when he received the unique gift. He said: "It's brilliant — this has come all the way from space. "It's a bit different to the one I found, it looks more like a lump of metal. "I'm very interested in meteorites now and will definitely keep looking for them." Josh's mother, Sarah Chapple, added: "It is so nice that Robert has read the story and obviously taken it to heart. "His kind donation has given Josh a great opportunity to see a real meteorite and I'm sure will encourage his interest in the subject. "Josh is very keen on learning about space — he regularly watches the stars and even knows a few of the constellations. "We'd both like to say a big thank you to Rob for thinking about us." 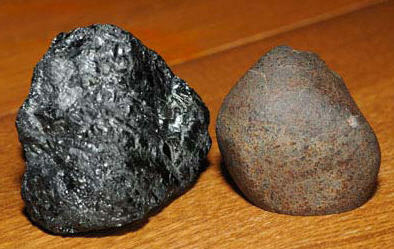 For more information about meteorites visit the Natural History Museum website at http://tiny.cc/jFUuE. Robert Elliott lives in Fife, Scotland, and has been hunting and selling meteorites professionally for the past 13 years. He bought his first meteorite from the small ads of an astronomy magazine in the mid-nineties for a few dollars and this soon became his passion. After several more purchases from across the world, Rob quit his job working on a space project for US Defence in Scotland to pursue his business of buying and selling meteorites. Over the years, Robert has travelled the world in search of meteorites — including several dangerous countries where he was bitten by a poisonous spider and had guns pulled on him. As well as dealing with museums, scientists and curators, Robert has sold meteorites to customers all over the world — including celebrities such as Queen guitarist Brian May, spoon-bender Uri Geller and the late king of pop, Michael Jackson. After a donation to the London Natural History Museum in 2002, Robert was also invited to dinner with one of his "all-time heroes", astronaut Buzz Aldrin. Robert said: "It was amazing to meet Buzz. Although I collect pieces of the moon, he has actually walked on it — incredible. 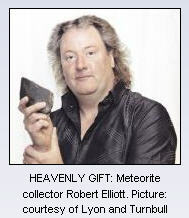 "Meteorite collecting is a big business in the USA but is becoming increasingly popular in the UK. "They often fall around the UK but, because we are a relatively small target, not many are found. "Also, due to the high iron content in meteorites, they can rust away relatively quickly." The Robert Elliott Meteorite collection sold for a total of £118,000 at an auction at Lyon & Turnbull in Edinburgh on Tuesday, August 18, 2009. Robert has now retired as a dealer and collector, deciding instead to concentrate on meteorite hunting, something he describes as "an expensive endeavour with highly unpredictable results."